Tomorrow we'll finally get to see the teaser trailer for Big Hero 6, the first animated endeavor from Marvel Studios and their new home at Disney. The film doesn't hit until November, but the project was on the list of my most anticipated films of the year, and the first look photos were great. 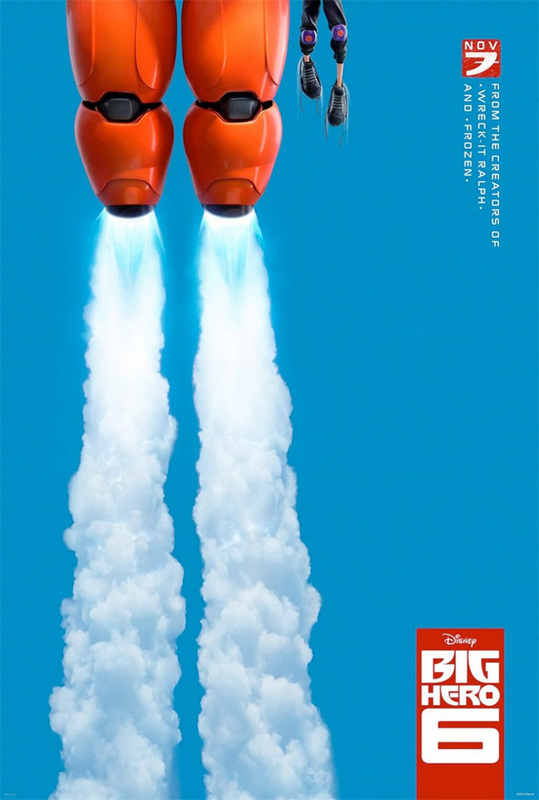 Now the teaser poster has arrived, and while it doesn't show much, it's a fun little look at the feet of robotics prodigy Hiro Hamada and his robot Baymax as they blast off into the air. We're still waiting to hear more about the cast and the story, so hopefully the teaser trailer sheds some light when it arrives at 9am PT tomorrow morning. Look below! Big Hero 6 is co-directed by Don Hall (Winnie the Pooh) and Chris Williams (Bolt) with a script that Jordan Roberts (3,2,1…Frankie Go Boom) co-wrote with the former. Based on the comic book series of the same name, the film marks the first collaboration between Walt Disney Animation Studios and Marvel. The story follows brilliant robotics prodigy Hiro Hamada, who finds himself in the grips of a criminal plot that threatens to destroy the fast-paced, high-tech city of San Fransokyo. With the help of his closest companion—a robot named Baymax—Hiro joins forces with a reluctant team of first-time crime fighters on a mission to save their city. Disney releases the animated film everywhere this fall on November 7th. Nice to hear a Japanese main character. Maybe it could be voiced by a Japanese person. I heard they decided not to make this a live action film because the source material is kind of racist towards Japanese people. Two americans created it and came up with names such as "Wasabi-No-Ginger", "GoGo Tomago", "Ebon Samurai", and "Fred". Ok the last one isn't racist, I just love that character. Ughhh...that is REALLY disappointing to hear. I was so excited for this project, now honestly, I have lost a lot of respect for it. Are you sure this was racism or were the creators just having fun with the names?